According to Stanley Rosenbaum, the Bible resembles what a family would retrieve after a tornado hits a trailer park—some of the family's own possessions mixed with those of others, overlapping, contradicting, and disordered. Understanding Israelite Religion is a revolutionary attempt to fill in the many gaps left in the historical record. 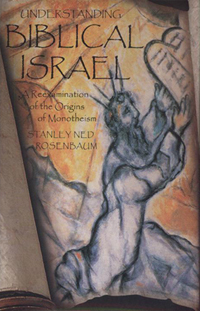 Rosenbaum begins by demonstrating that Israel’s religion was not a clean, divinely inspired break with humanity’s past, but derives from the long sweep of events that began when Homo sapiens first acquired language. Strata of earlier religions are still visible beneath the surface of Israelite monotheism. Early Israel was not "one man’s family," however dysfunctional. It was a collection of individuals and groups, mainly outcasts or lower social elements, who coalesced into a nation and developed—though they did not always follow— a religion of ethical monotheism and principles of democratic government and social justice that still today move and inspire more than half the world’s population. Like all religions, Israel's was shaped by the language, in this case Hebrew, in which it is expressed. Expressing monotheism in a language that is essentially dualistic conduced to the suppression of the female elements of earlier religions which had nurtured Israel's religion, and consequently, to a lack of appreciation for the part played by women in Israel's religious life. This skewed view of Israel's religion and its history that the Bible contains is a result of its having been collected, edited and in part written by Judeans, southern survivors, and heirs of David's kingdom who were moved to record it in the wake of the destruction of Jerusalem in 586 BCE.